December 12, 2017—ST. 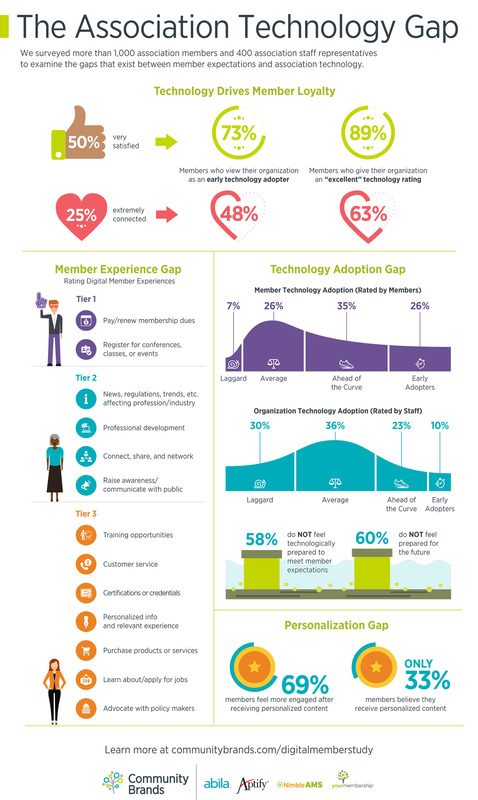 PETERSBURG, Fla.—Community Brands, a technology-driven company that delivers purpose-built solutions for the world’s leading associations and nonprofits, announced today findings from its Digital Member Study: Examining the Gap Between Member Expectations and Association Technology. This study explores current member experiences and the technology used by their professional membership organization, as well as the importance of emerging technologies and how members want to engage. Technology drives member loyalty. There is a strong correlation between loyalty and technology. 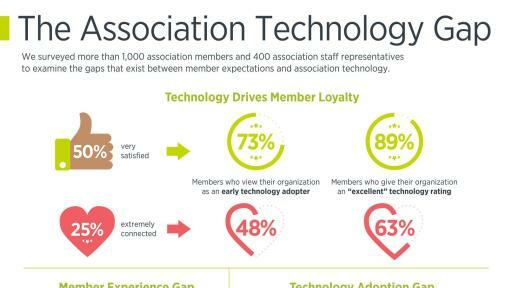 Members who see their organization as an early technology adopter are significantly more satisfied with their membership and feel more connected to their organization. 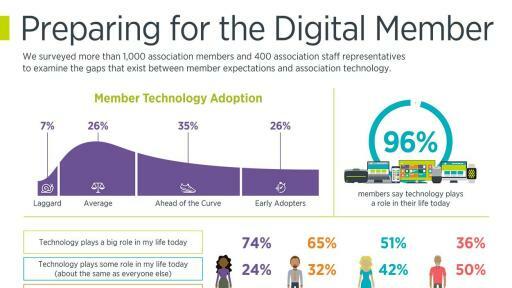 Members are ahead of the technology adoption curve. Sixty-three percent of members say technology plays a big role in their life. Most members describe themselves as ahead of the curve or early adopters of technology. There’s a growing member experience disconnect. Gaps exist between what members value and where they believe their organization delivers the best experiences. Members give lower technology experience ratings for many of the key benefits that drive retention, such as certifications, training and advocacy. 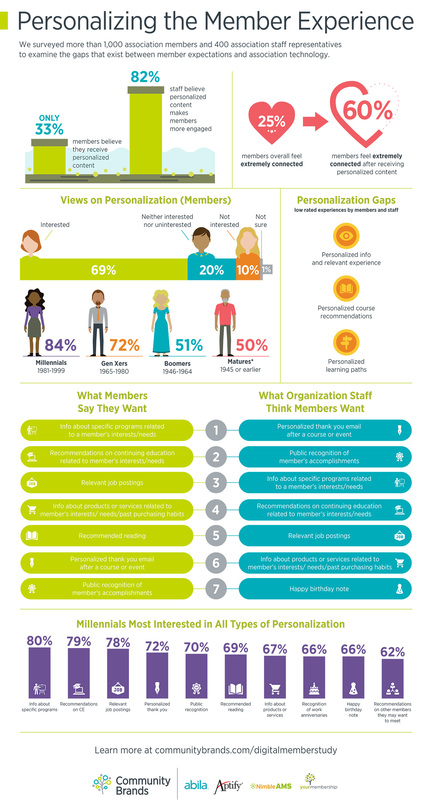 Professional membership organizations don’t leverage personalization. 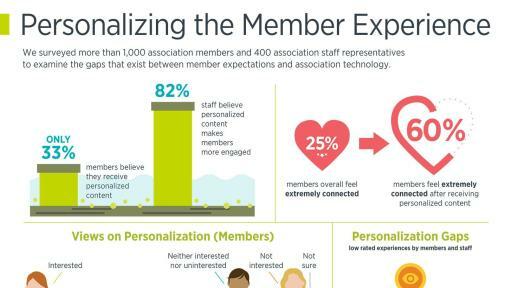 Most organizations believe personalization makes members feel more engaged. However, the majority today do not put enough emphasis on creating a personalized experience with recommended content members value. The future is analytical, predictive and personalized. Organizations which consider themselves early adopters are more likely to use data science and predictive intelligence. Most organizations are also interested in providing more personalized content based on past activity. Professional membership organizations do NOT feel prepared to meet member expectations. Few see their organization as technologically advanced or even technologically prepared for the future and able to meet members’ expectations. Thirty percent of surveyed staff describe their organization as laggards when it comes to technology adoption. Only a quarter of professional membership organizations say they will increase their technology investments in the future. The main barriers are cost, questions about return on investment (ROI), and the ability to impact the member experience, as well as concerns about integrations and member usage. The entire report can be downloaded at communitybrands.com/digitalmemberstudy. Commissioned by Community Brands, Edge Research fielded parallel surveys to 1,032 U.S. members who self-reported they belong to a professional membership organization and 400 staff representatives who work at these organizations. Survey respondents were recruited through an online non-probability sample, and quotas were set so the survey was representative by key demographics. The survey, which was fielded October 18 - 30, 2017, examined attitudes, values and behaviors about technology from both member and staff perspectives. Community Brands is a technology-driven company that delivers purpose-built solutions to more than 13,000 of the world’s leading associations, nonprofits and government entities to help them thrive and succeed in today’s fast-paced, evolving world. The company’s focus on accelerating innovation and bringing to market modern technology solutions helps power social impact, effect positive change and create opportunity. With Community Brands software and services, organizations better engage their members, donors and volunteers; raise more money; effectively manage revenue; and provide professional development and insights to power their missions. To learn more, visit www.communitybrands.com. Get social with Community Brands on Twitter and LinkedIn.